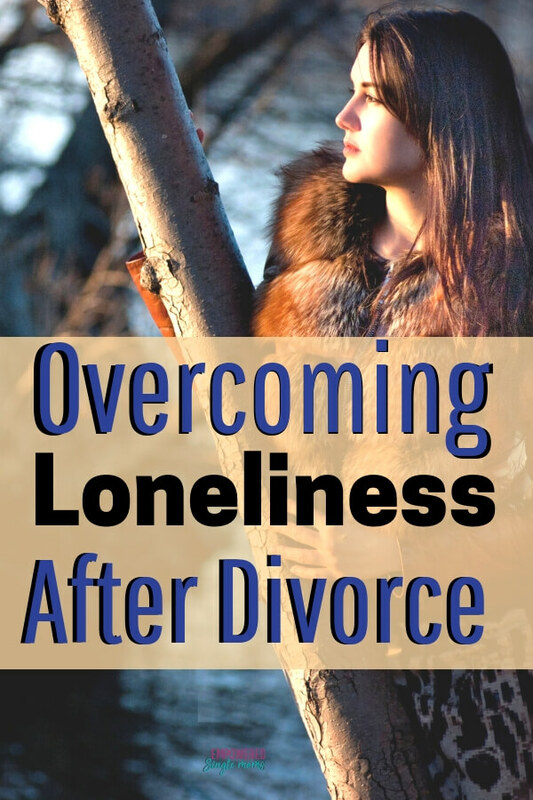 Overcoming loneliness is never easy, but the loneliness of being single after divorce nearly crushed me. Fortunately, it also taught me a few things. 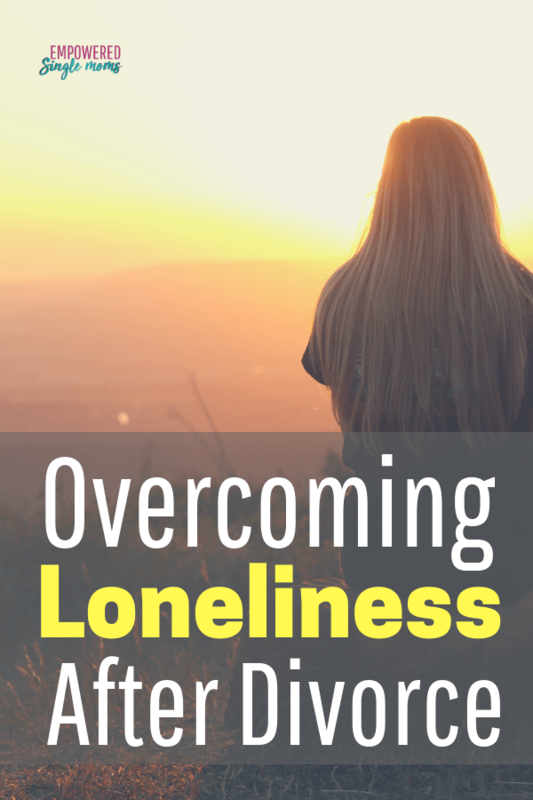 How do you overcome loneliness after divorce? Keep reading. Let me share what I now know. I felt lost and isolated. I was losing the life I knew, my husband, and the father of my children. But that was not the worst loss. The most painful loss of all, the one that made the loneliness almost unbearably heavy, was that I had lost my best friend. I grieved that loss. My husband had been my best friend for almost 20 years. I suppose my best friend had been leaving me bit by bit for months, but the separation made it real in a new, more painful way. It was a pain that took my breath away and made it hard to get out of bed. I felt pathetic. I probably was pathetic, truth be told. I was browsing in a bookstore and this book nearly fell into my hand. Click here and get the book for yourself. I started reading it and realized yes someone has been here before and they know the way out of this misery. Reading it was the beginning of feeling better for me. Spoiler alert: I made it through those dark days. I overcame the loneliness of being single again. So can you. I made a private Facebook group just for you. Join the group, Empowered Single Mom Tribe by clicking here. The loneliness after divorce can be part of grief and sadness, and it can even venture into depression. The ideas below will help you cope with the pain of loneliness after divorce. Grief is the natural reaction to loss. You can experience grief after any type of loss, not just death and divorce. You may experience grief after a job loss, when you lose a physical ability due to an accident, or through the aging process. Often, when people have a child with a disability they grieve the dream of the healthy child they had hoped for. In divorce, one of the most difficult griefs is not the loss of the relationship you had, but the loss of the relationship you dreamed of having. This can be more painful than the loss of what was. If you don’t know how to help a grieving friend, if your friends don’t know how to help you, and/or you don’t even know what to ask, I have some ideas for you. Don’t shy away from friends who are grieving. They probably want to connect. When we are grieving, we want to know that we are not alone. Invite a grieving friend to do something like go to a movie, play, or concert. In these scenarios, there’s little pressure to visit but they will benefit from companionship. Invite your grieving friend for coffee or lunch. She probably needs to eat; often we lose our appetites during grief. If the grief is due to a death, sharing a memory of the deceased is often a comfort. Understand that sometimes there is nothing you can say to make it better. Sometimes, it is about being with the hurting person. Simply being able to be together in a peaceful silence can be incredibly comforting and special to a hurting person. Really listening is one of the most precious gifts you can give. And if your friend is a hugger, offer a hug. Sometimes when we are grieving we venture into the land of depression. Depression can feel like sadness, but often depression feels more like nothingness. It feels like apathy. You just don’t much care about much of anything. It is as if you can’t feel enough to even be sad. This nothingness can be somewhat peaceful if the depression is not too severe. Other times, the pain is overwhelming and you feel like you are lost in a deep, dark pit. There is a ladder in that dark place to help you get out, but you are so confused you not only cannot find the ladder, you begin to doubt that one exists. You aren’t really thinking straight and feel like you are in a fog. Yet other times, the pain of depression is crushing. You don’t think you can possibly bear this pain. If this is the type of depression you are feeling, you need to work with a professional counselor. If you are depressed for more than a few days, go see a professional. A psychotherapist/professional counselor can help you find that ladder and climb back to joy and happiness. There are different kinds of depression. There are people who struggle with depression that is a chronic illness. Sometimes this type of depression will go away, but other times you need to learn to manage it. Then there is the depression that comes with a huge life stress like divorce. If you do not have a history of persistent depression and this is part of adjusting to divorce and your new life, it will most likely go away. If it persists for more than a few weeks, get professional help to avoid getting stuck in grief or depression. There are many things you can do to ease the loneliness after divorce. However, the first step is to take charge of your life and make extra efforts to connect. Next, acknowledge that there are different kinds of loneliness. Consider what you are feeling so you can decide what actions to take. If you are lonely because you are disconnected from yourself, reconnect with yourself by meditating or journaling. If you feel disconnected spiritually, focus on strengthening your spiritual connection through prayer, study, and being involved with a spiritual community. There is the loneliness of wanting more connections with other people. If that is the kind of loneliness you are feeling after your divorce, reach out to friends and try new things to make new friends. There are many lonely people in the world, and the person you reach out to may need the connection as much as you do. I am happy to say that after the initial period of depression and loneliness, I was able to rebuild my support system. I reconnected with friends, made new friends, and explored new interests. Some of these people and interests may not have come into my life had I stayed married. Watch for the new opportunities that come into your life after divorce. Those opportunities will come to you and you don’t want to let them pass. 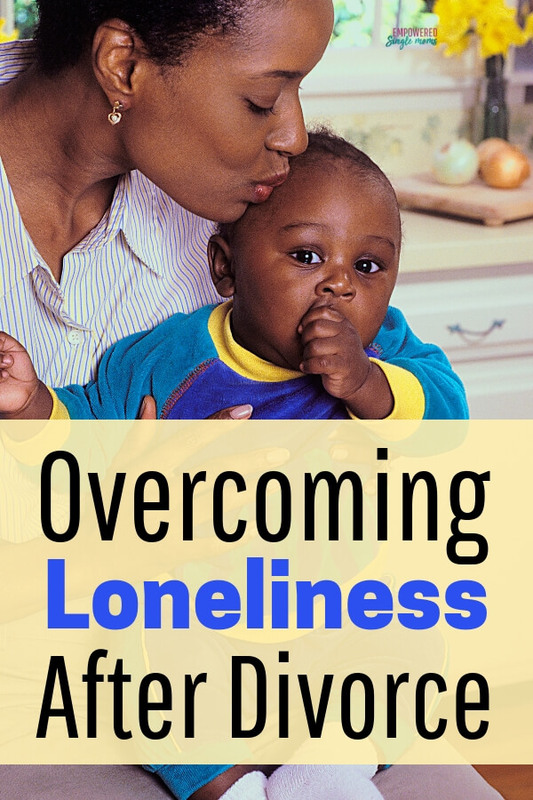 I asked the single moms in our private Facebook group, Empowered Single Mom Tribe for their advice on how to get through the loneliness after divorce. You can join the group here. Your attitude is an important tool for dealing with loneliness. If you focus on the losses, that is what you will see: loss, grief, and lack of support. However, when you focus on the opportunity to do new things and meet new people, you are much more likely to make new friends and try new things after your divorce. The women in the Empowered Single Mom Tribe had some wonderful ideas of new things to try to make new friends. Have you ever wanted to start a blog? Get blogging tips for beginners here. Journaling is another effective way to reconnect with yourself and figure out who this new you is in this season of your life. You can find some fantastic journaling prompts to get to know the new you here. Many of these ideas are in this article on healthy habits by Blue Zones. It may feel like loneliness will crush you, but let me assure you it will not. Like me, you are too strong and too solid. Loneliness is temporary. Like any other kind of healing, feeling connected and happy after divorce takes time. Use the tips above to speed up the healing process and find your new normal. 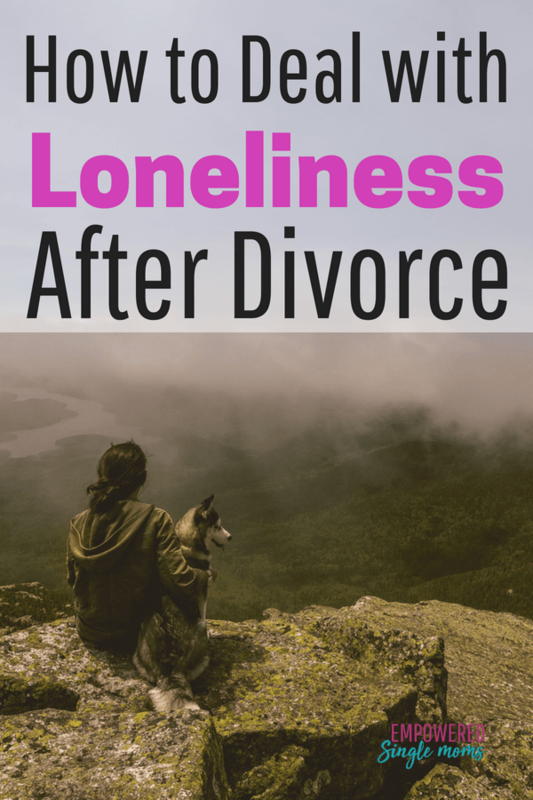 Do you have other tips to for shedding loneliness after divorce? Please share them in the comments!